I came across this diagram some time ago. When I saw it I laughed of course but deep down knew that this was an image portraying a hard truth. Worry and anxiety can consume so much of our energy. I can’t even imagine the amount of time and energy that I have lost over the years to worrying. Fortunately, at some point I realized the nature of worry. 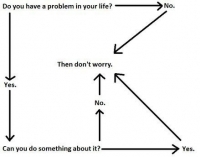 Worry is defined as “a state of anxiety and uncertainty over actual or potential problems”. I and probably most of us are in a state of worry or uncertainty over actual or potential problems. That is why I like the little diagram above. Yes we do have problems in our lives. Many of our problems are very real. Right now for millions of Americans one problem among many is unemployment. Feeling anxious and worried about not having a way to pay for shelter and food is probably an understatement. Yes, you are going to be more than just worried. The challenge comes is when that anxiety becomes bigger than it actually is. Rollo May refers to this as neurotic anxiety. From his 1977 book The Meaning of Anxiety he states “Neurotic anxiety, therefore, is that which occurs when the incapacity for coping adequately with threats is not objective but subjective—i.e., is due not to objective weakness but to inner psychological patterns and conflicts which prevent the individual from using his powers”. Subjective threats meaning those threats we believe are far worse than they actually are based on our own personal perceptions or beliefs. Sometimes those “threats” become so large and severe that we believe that the only thing that we can do about them is to suffer in fear and oppressive anxiety. We can forget that we still have the freedom to make choices to change our circumstances. In Rollo May’s existential psychology anxiety is not an illness or pathology, anxiety is a part of our experience as human being. It is not the anxiety that harmful. What is harmful is ignoring or getting stuck in it. Anxiety is the alarm that tells us that we need to tend or deal with what is on our minds and in our hearts. Taking a laissez-faire attitude and not worrying or discounting one’s anxiety may deny us the opportunity to make a change that would be beneficial. The phrase “Don’t worry be happy” does not mean “Don’t worry, be oblivious”. Anxiety presents us with the opportunity to action. Being anxious about not having a job may push us to make a career change or it make take us to shift our personal beliefs about work and livelihood. It may even push us to take part in a more collective action, like the thousands who are Occupying cities all over the world. The idea of allowing and working with our anxiety and worry is meant to lead us to personal satisfaction and happiness. That is the idea that is encourage in existential theory and therapy. In the image the flow chart moves from realization, to recognition to resolution. Yes, you can be worried about something. Can you do anything about it? Yes or No, the intention is not to be stuck in worry or anxiety but to work with it and to understand that anxiety is part of life and that can be more of a catalyst than a roadblock.